Keep that super-lean gamebird meat moist and tender using some ingredients and techniques you may not have tried. 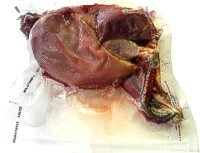 Unlike commercially packed meat, this wild rooster was shot in the field, then cleaned, skinned and eventually frozen in a vacuum-sealed bag (with spurred leg still on to show his roosterness, in case the game warden's checking coolers). This task is easier with a very sharp knife. Could you use some tips on boning? 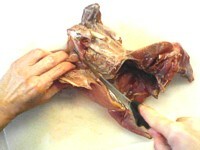 Take a look at our free "How To Bone A Game Bird" online tutorial! Clean, boned bird meat, resting on wax paper, ready to cook. If you're like us, you're always a little apprehensive about trying new game recipes. 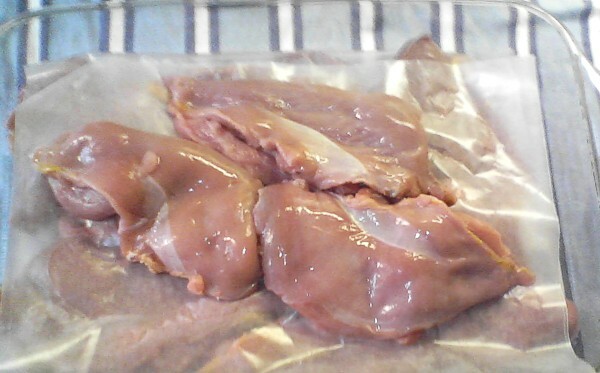 After hunting, carefully cleaning, and storing that hard-earned game in the freezer, it would be grievous to ruin it on a not-yet-tried new recipe that doesn't turn out to do the birds justice. But frozen game meat doesn't keep forever, so as a long-planned New Year's Eve dinner approached, we decided to thaw a few pheasants and seek out a new way to prepare them. Some time ago we decided that field-shot game birds were best cooked and served off the bone. The thinking is that, with the bird meat boned, there are more cooking options. Almost any recipe (other than a stuffed game bird) that calls for cooking on the bone is also well suited to boned birds. And, for chefs working with field-shot birds, there's an important plus: the process of boning the bird involves close handling of each piece of meat â€“ and that means you're more likely to find all the birdshot, punched-through feathers, and broken bone shards that are just a normal part of grocery shopping with a shotgun. So, after thawing and boning the birds, we Googled the words "recipe," "pheasant," and "boned." The pick of the recipes we found looked just about as we had hoped to find, and turned out to be one of the best we've tried. Pheasant browning in the hot pan. Grapes spending just a moment to get warm. 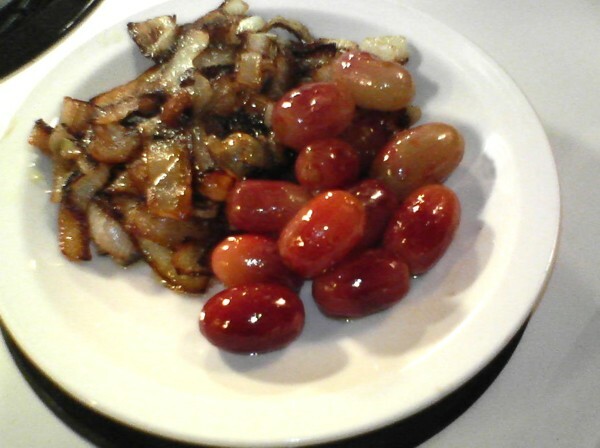 Browned onions and just-warmed grapes set aside as the meat roasts. We show the original recipe here (to the right), but it's important to note that in our variation, we altered the ingredients and process a bit to suit our tastes. First, we omitted the pearl onions, and instead used slices of yellow onion browned in olive oil and a tablespoon of butter. Once the onion was quite brown, it was removed and set aside. 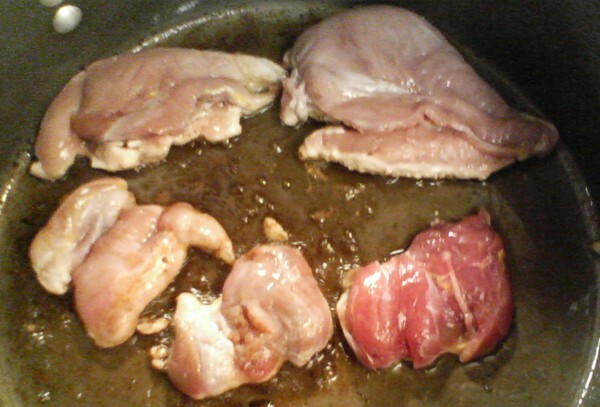 While the oil and butter was still very hot, we used the same pan to sear the pieces of pheasant. That crucial searing step should be done at a high temperature, and done very quickly to avoid over-cooking the meat. Once just seared, pour 1/4-cup of pure maple syrup over the pieces, coating them. Then, leaving much of the syrup in the pan, remove the meat to a shallow pan and roast it, uncovered, in a 300F oven for 7 minutes. The idea here, again, is to make very sure you don't over-cook, since the meat can quickly become tough if you do. 7 minutes may not seem like very long, but remember: once meat has been brought up to cooking temperature, it will continue to cook a little after it has been removed from the heat source. While the meat is roasting, you have a few minutes to complete the rest of your work. First, sauté for a couple of moments, in the searing pan, the grapes and chopped shallots. Because the pan will still be hot, keep the sautéing brief â€“ the minced shallots will just take on the color of the sauce, and you don't want the grapes to become much more than warm â€“ they should remain fairly firm. 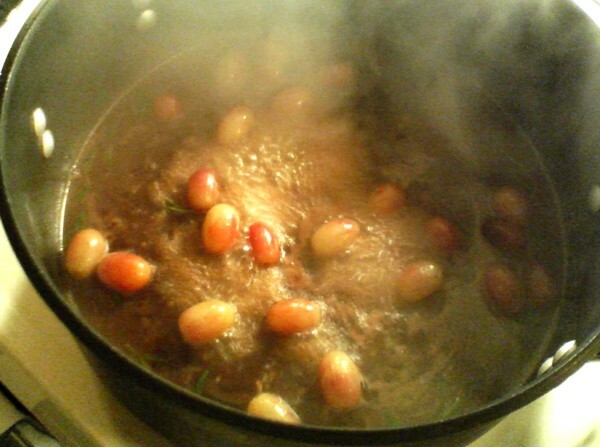 Remove the grapes with a slotted spoon and set them aside with the previously browned onions. Browned, uncovered pheasant roasts gently in the 300F oven. 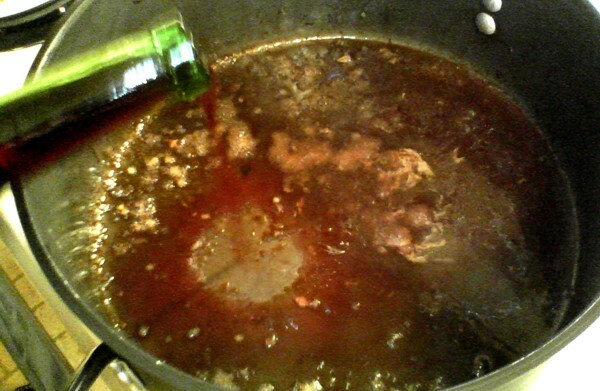 A splash of port is used to deglaze the sauce pan. 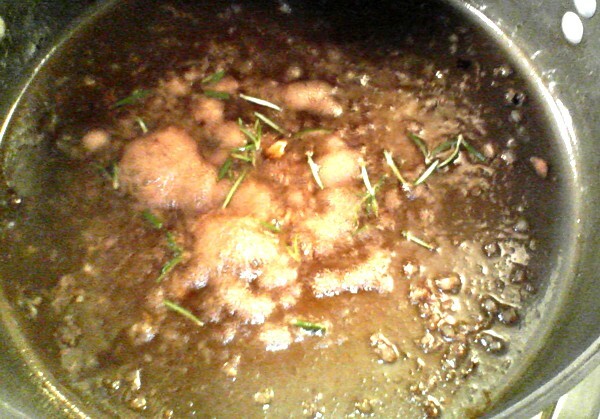 Stock is added to the pan, and then a pinch of nutmeg and the rosemary leaves add more flavor and texture. With the sauce complete, the meat, grapes and onions go back into the pan for a coating. Next, deglaze the searing pan with a 1/4-cup of port wine, and then add the stock. We used organic boxed chicken stock with an added teaspoon of "Better Than Bouillon" beef base (much like a demi-glace, but, if store-bought, much less expensive... a little goes a long way - give it a try here). We chose to add the leaves from a two-inch sprig of fresh rosemary along with the original recipe's pinch of nutmeg. All of that is then reduced to a consistency that suits â€“ we reduced it quite a bit, so that the sauce was rich and syrupy. Salt to taste or, leave that to your dinner guests' palettes. Take the pan from the burner, and place all the pheasant pieces, sautéed grapes, and browned onions back into the reduced sauce, and stir to coat. When serving we chose a more provincial style of presentation than seen in the original recipe, which seemed a bit daunting to us. 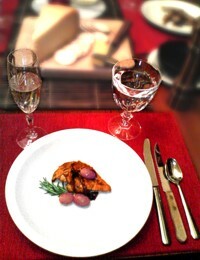 For the New Year's Eve dinner, since we also grilled beef tenderloin, we served one pheasant breast garnished with a few grapes and a sprig of rosemary as an appetizer along with a glass of good champagne (a dry brut, not a sweet spumante). And, because we liked this preparation so much, we made it again a few days later with good results and served it as the main course. As an entree, the dish's fruit tones and subtle sweetness call for a bottle of Syrah (or, Shiraz if you buy from down under). Our final thought on this recipe is: trust the recommended cooking times and temperatures. Brief, high-temperature browning, and just the right roasting time will leave you with mouthfuls of succulent game bird meat. Have everything else you'll need for your meal ready to go so that you can focus entirely on treating the pheasant properly just before you serve. You'll be rewarded with a meal that truly honors the effort of the hunt. This recipe can also be prepared with veal, chicken, pork or any other white meat. Since pheasant is much leaner than traditional white meats, I advise cooking it at low heat: overcooking will make it tough and dry, which you naturally want to avoid. For presentation, I place the pheasant breasts on a bed of spaghetti squash and wild rice with mild garlic that I arrange in circles using a mold. They are accompanied by slices of yellow zucchini, thinly sliced carrots and other fresh vegetables. The plate is decorated with a dried thin crêpe and a thin slice of fried celeriac. Sear the pheasant breasts over high heat, skin-side down, in a little olive or walnut oil, turning from time to time; add the maple syrup, turn the breasts skin side down and cook in a 300F (150C) oven for about 7-10 minutes uncovered; remove; let rest, being sure to cover the breasts so they don't dry out. 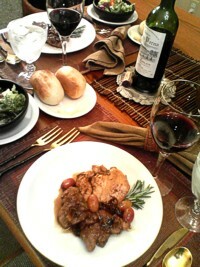 Place the jus from the pheasant and maple syrup into a saucepan, add the shallots, pearl onions and grapes; let everything caramelize; add the port and game stock or demi-glace; remove the pearl onions and grapes; let reduce with a touch of nutmeg until the sauce has reached the desired consistency; strain; add the grapes and onions back to the sauce and set aside - cover until serving time so that a skin does not form on the surface; arrange the whole breasts on a warm plate and spoon the maple sauce with the onions and red grapes around them; accompany with fresh vegetables. before a main course of venison.